You are currently browsing the tag archive for the ‘OTTER’ tag. I was meeting up with other otter ecologist colleagues from neighbouring counties where otters are few and far between to keep our hand in with surveying for otter and water vole signs. After about our third attempt at trying, with delays due to grant deadlines and flooding I finally met with our host Darren Tansley from Water for Wildlife/ RiverSearch at Essex Wildlife Trust, Sam Mcabe from London Wildlife Trust and Jon Bramley from Kent Mammal Group for the arduous task of visiting sites along the River Colne around Fordham. A beautiful sunny day. Sweeping Essexcountryside. 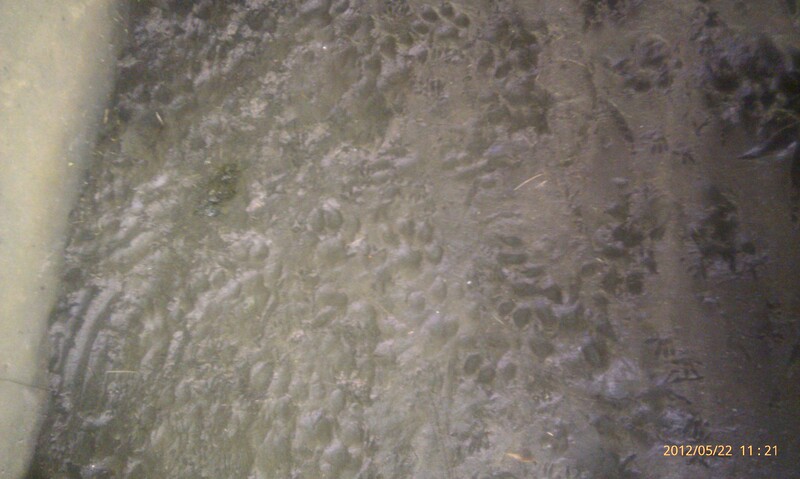 Four wildlife geeks easily worked up over mammal poo and tracks . As you can imagine a really arduous day! 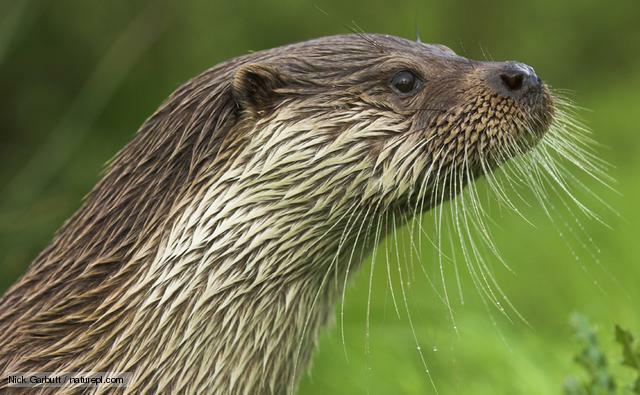 I have the greatest respect for the work Darren has been doing for otters and water voles and it’s a real inspiration for me being new in post as Wetland Landsacpe Officer. However I do think he’s making Essex a little too cosy for riparian mammals and maybe they aren’t too fussed about making the trip down intoKent, Surrey andLondon! I do consider that a challenge though to build on the great work my predecessor Chris Matchamstarted and create more suitable habitat. The first bridge we came to was teaming with otter sign: prints and fresh otter spraint. We all joked how Darren had probably been out the night before with a fake otter paw on the end of a long stick and set up the perfect scene before us. None of us wanted to imagine how he’d come up with fresh otter spraint in this scenario however! I found this particularly interesting because we found water vole signs in the ditch running through the nearby field. Darren told us that before mink trapping started in earnest it was ditches like these that were providing refuges for water voles. 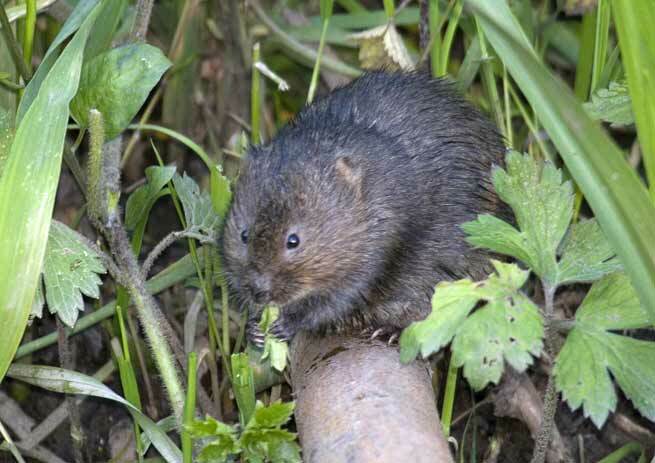 Once mink removal began it allowed the water vole to return to the main river where the habitat was correct. 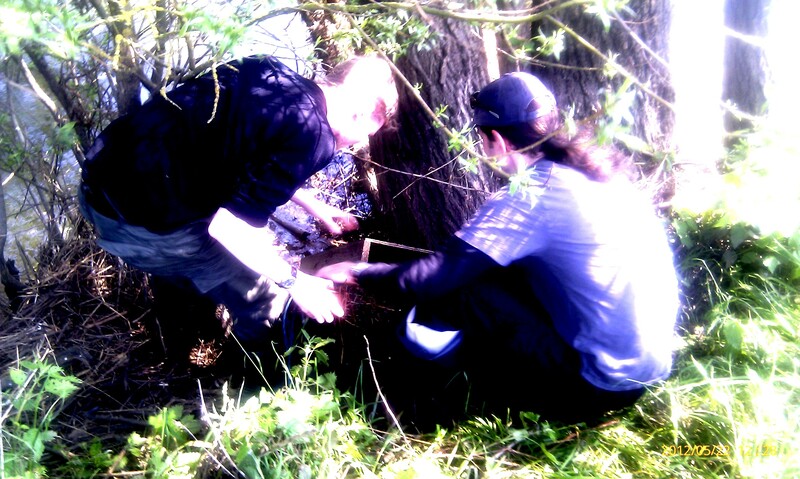 We found water vole signs also along the main river here where they hadn’t been before. A key lesson for us in Surrey where water vole have apparently disappeared- we need to off-line ditches and streams. 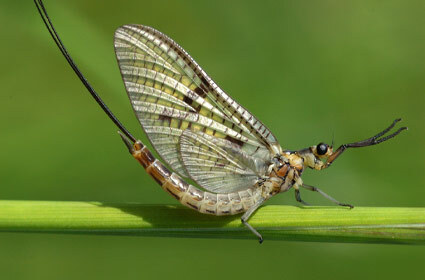 Not one to be accused of being mammal fixated, I was entranced by the dance of mayflies today. They were out today in full force, exquisite creatures with delicate veined wings. I caught myself imagining I was small enough to climb up on the back of one like some minature knight. Only the finest jewel-encrusted armour would do for such an impressive winged steed. Where the banded demoiselles friend or foe I wondered. Well folks, it was a very warm day, and maybe there is some chemical given off by otter spraint that’s a tiny bit psychoactive! 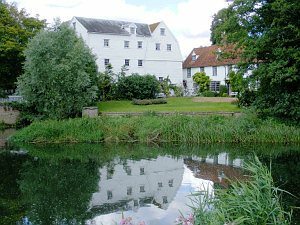 If you live in Surrey you’d be interested to know I will be organising a River Search approach and will need volunteers to train up to help look for otter and water vole signs inSurrey. Watch this space. My mind was full of ideas on my journey back to Guildford, which is probably why as soon as I parked up at home it dawned on me –you know the feeling, a cold chill precursor to the moment of revelation of how much of an idiot you have been- that I’d left my fleece, with my front door keys, in Darren’s car. After deciding not to drive back toEssexI thought of the landlady who would undoubtedly have a spare key. Wouldn’t she? I turned to my mobile, with landlady’s telephone number stored on it, which promptly died in my hand. Charger? In the flat: Urgh! After a few moments of panic I collected myself and drove round to my friend Sarah’s house- she was bound to have landlady’s number still, after living in my flat some years before. With luck she was in and although she didn’t have the number her neighbour had a charger for an HTC mobile and with luck on my side I soon had a spare key in my possession. Phew!